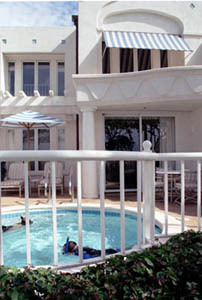 Thursday, January 7, 1999 -- We arrived at our Villa at the Kea Lani resort on Maui. We of course set up internet access as one of our first activities (it was too rainy to play on the beach). Maui Net gave us a very reasonable weekly rate. Friday, January 8 -- Tom & Mom snorkeled in the plunge pool, looking for interesting fish. Tom explained the ritual of one snorkeler excitedly pointing out something to another snorkeler, to which the other snorkeler must express excitement, or suffer an endless exchange of silent explanatory gestures. 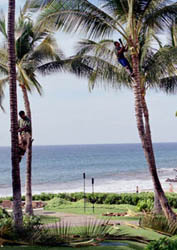 Meanwhile, workers pruned the palm trees and Cathy wandered around taking photos. Dinner at Nick's, with the most zealous restaurant service ever. Half way through the meal, they replaced our water glasses with fresh ones filled with ice. Tom discovered the "Lava Flow" variation of a Pina Colada. Saturday, January 9 -- Lunch at the hotel cafe; Tom had another Lava Flow, or was it two? We tried to snorkel at Ulua Bay, but failed, the surf was too rough. 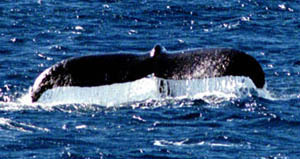 That afternoon, we went on a whale watching tour, and saw lots of whale parts. Mostly we seemed to be cruising near a group of four whales. We saw spouts, humped backs, flukes, dorsal fins, and dorsal and fluke slaps. We learned that whales are big. Sunday, January 10 -- We snorkeled at Olowalu Bay. Mom and Dad had their first snorkeling experience. After lunch, and several Lava Flows, Mom and Tom napped while Cathy and Dad walked the path north along the shore. The napping was made difficult by the arrival of the noisy neighbors, but Mom and Tom persevered. Sleeping that evening was made difficult once again by the mindless laughter of the noisy neighbors. Nothing can be constantly funny from 8:00 pm until 11:38 pm without the aid of drugs. Monday, January 11 -- Tom had fun on the water slide. Someone from the hotel wandered through the pool-side seating offering fresh pineapple slices to everyone. Tuesday, January 12 -- We packed up and headed for the Big Island. All photos Copyright © 1999, Cathy Saxton & Tom Saxton. All rights reserved.